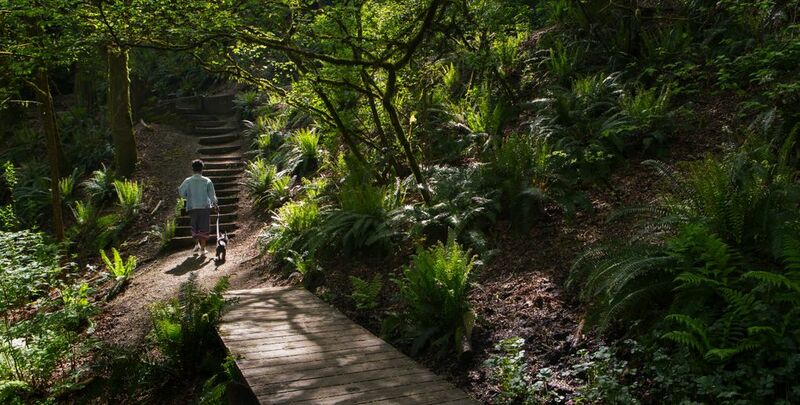 Strolling through Seattle can improve your health and introduce you to your city, and to your neighbors. SEEING THE CITY from the eyes of a walker is like putting on glasses with an updated prescription — colors are richer, more saturated; the outlines of neighborhoods that flash by in a car, bus or train are sharper and more distinct; landmarks morph from buildings to the incline of a familiar hill; you witness a beloved tree bursting with green in the spring and shedding its vivid foliage in the fall. Walking is ordinary. It is so ordinary, most of us do it without thinking: You put one foot in front of the other to get to the bus, to walk from your car to the office, to pick up something from the store. It requires only shoes — and, because we live in Seattle, some days a raincoat or umbrella. Walking can introduce you to neighbors. Walking can shed pounds. Walking can create time. • Add 10 minutes of walking per day. • Walk to stores, libraries or coffee shops within 1 mile of your home. • Map your routes. If a route is 1 mile or less, walk one direction, and take transit the other way. • Want to walk to work? Walk the route on the weekend, when you have time, to get a sense of how long it will take. • If you take transit, get off one stop early. When 24-year-old Bénédicte Bicaba puts her feet to earth in her Roosevelt neighborhood, her mindset shifts. It also alters how you see Seattle. 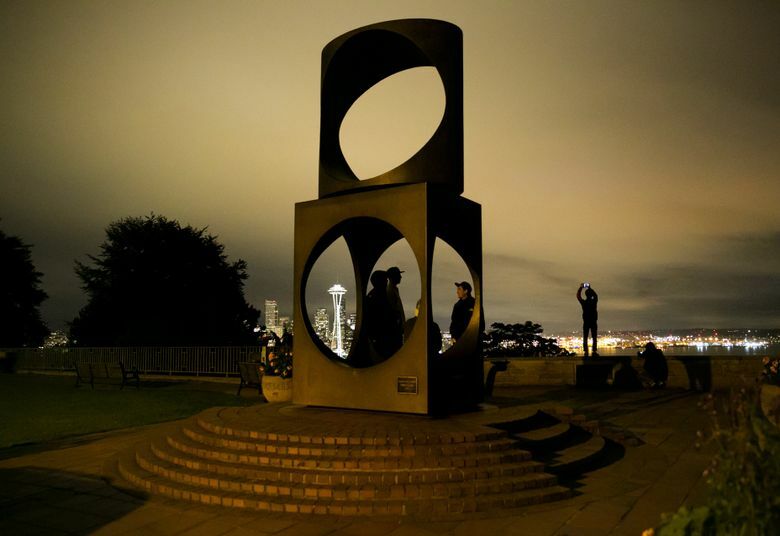 John Stewart, a Central District resident for more than 20 years, observes his neighborhood with a sharper lens. Seattle’s street design encourages foot-powered movement, though folks in hilly neighborhoods or near Aurora or Lake City Way might want a word with the city’s original planners. Mostly, our streets are narrow, with tight turns that force drivers — the biggest danger to walkers — to slow down. 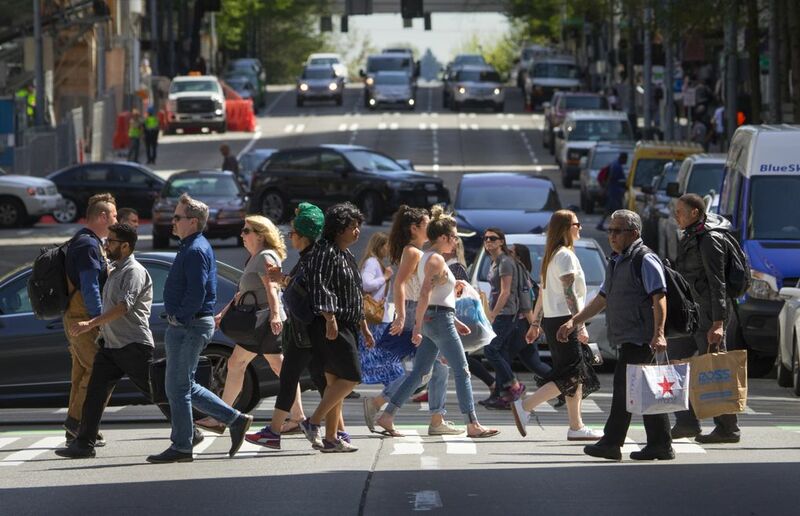 The city has lowered speed limits, focused on making transit hubs pedestrian-friendly and tested timed crosswalks to help drivers see pedestrians, says Jim Curtin, traffic safety coordinator for the Seattle Department of Transportation. Seattle — along with San Francisco; Washington, D.C.; and New York City — has one of the lowest rates of pedestrian-vehicle fatalities in the country, Curtin says. Still, the city has about 400 to 450 pedestrian-vehicle collisions a year, and 11 were fatal in 2017. When framed by the numbers, walking feels even more vulnerable: exposed to cars, weather, noise, other people. But when you walk, the city unveils its history and soul, in slow motion. Walk the cobblestoned streets of Pike Place Market, and look at buildings that once housed seamen. Take in breathtaking panoramas from Alki in West Seattle, and observe how the skyline has changed. 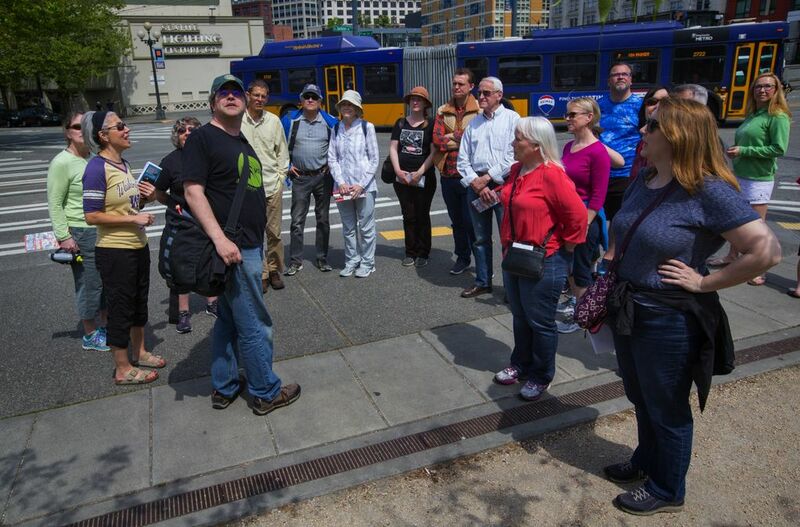 Get out on foot in Sodo, and interact with people living on the streets. Walking tells us more about who we are as a city, and the change and growth that permeate every neighborhood. The sharp clang of train horns and the roar of trucks dominate a stroll in Sodo. Homeless folks living in tents occupy corners under bridges. You have to raise your voice to be heard. Sodo is where Colin Stewart worked for three years at the state Department of Social and Health Services, and where he walked every day. Early on, Stewart walked for his own health as well as for a break from work. A former soccer player, Stewart, 59, took up walking after his knees made it tough to play. He wanted to know the neighborhood, which also is home to Starbucks headquarters, warehouses that hold furniture and host events, and restaurants. On his lunch breaks, he watched as the city dismantled The Jungle, the homeless encampment under Interstate 5, and saw tents and people spill out into the streets. He has witnessed police-car chases and drug deals, and has seen workers in hazmat suits. With a methadone clinic across the street from his office, the neighborhood could feel intense. His walking group watched as murals of a sparrow, a hawk and a fox were painted over graffiti near the light-rail tracks; they speculated about the artistic point of a mural of a car. On walks, they talked about life outside of work. Stewart still likes solo walks. He moved offices recently, but works occasionally in Sodo. “I can walk and be quiet and reflect, and look at the trees,” he says. A walk with Michael Powers is brisk. 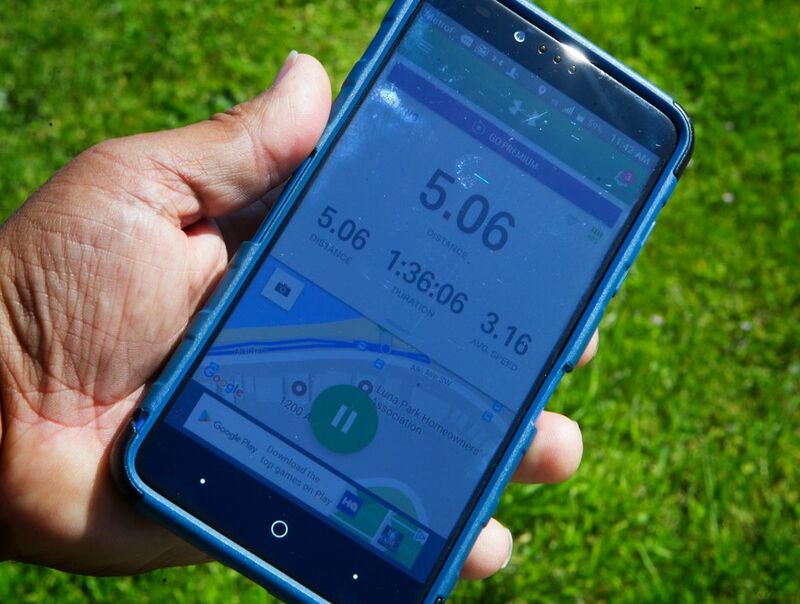 He walks fast, and tracks the distance on his phone. He will grab a backpack and walk the 2 miles from his home in High Point to the Alaska Junction in West Seattle to pick up groceries at Trader Joe’s, or to go to the bank or the post office. For a challenge, he walks from High Point through Lincoln Park to Alki and back, around 10 miles. It once was. A decade ago, Powers, now in his 50s, watched a show about comedian Bernie Mac. Mac said he had worked hard and wanted time off; six months later, he died. Powers, a musician, related to working hard, playing 300 shows a year at the time. Walking was an activity he could do anywhere. We met for a walk at Alki on a sunny day, and he directed us away from the skyline so we could enjoy the view on the way back. He told me about the time he saw huge waves carry giant pieces of driftwood to the beach. When he walks, he takes varied routes so he can see new houses, different views and tucked-away streets. Powers walks with others, but if they want to do only one loop around Seward Park, he does the second alone. He listens to podcasts or TED Talks on walks. If it’s raining, he bundles up; he doesn’t like being cold. Since he started walking, he says, he feels stronger. Fit. Confident. Walking 4 to 5 miles isn’t a big deal. He has inspired family members to walk more. He uses his car less. “Live simply, so you can simply live,” says Powers, a guitarist who continues to record and play shows. Just not 300 a year anymore. When Anne Vernez Moudon moved five blocks farther north in Belltown, she noticed her trips to Pike Place Market declined. Five blocks isn’t far, but Moudon changed her patterns. She is intrigued by the choices people make to walk, or to not walk. 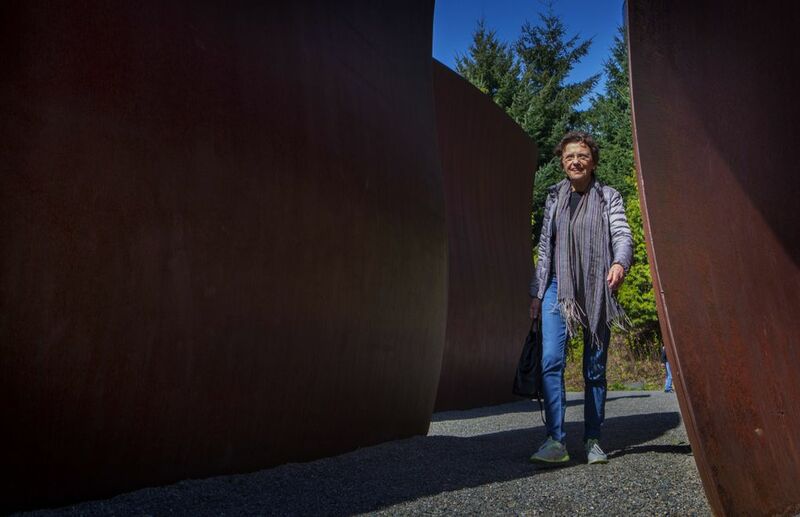 A University of Washington professor emeritus of urban design and planning, she immerses herself in the subject of walking, an indicator of a lively, socially interesting city, she says. One of her students helped create Walk Score, a rating system to indicate the walkability of grocery and convenience stores, schools and libraries to a home or location, she says. Research shows people who live in walkable neighborhoods walk more, she says. More activity is connected to lower weight. I met Moudon, an energetic 72, at a coffee shop in Belltown. Moudon is a walking historic city record. She rattles off the design and process behind buildings from Belltown to downtown. She knows every change the city has made — or not made — to make streets greener or more pedestrian-friendly. Most of us are ignorant of our habits, Moudon says. If you take transit, you are far more likely to walk. Recreational walkers go longer distances, but do it less often. It’s hard to get people to be physically active, she says. 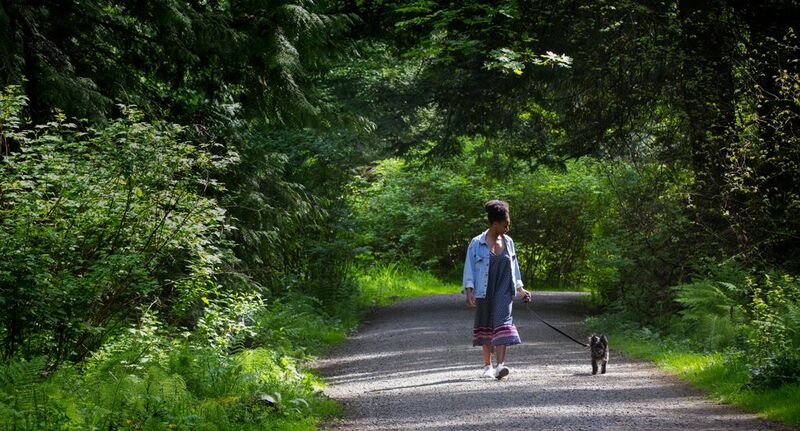 “A five-minute walk makes a difference for modern, contemporary people,” she says. 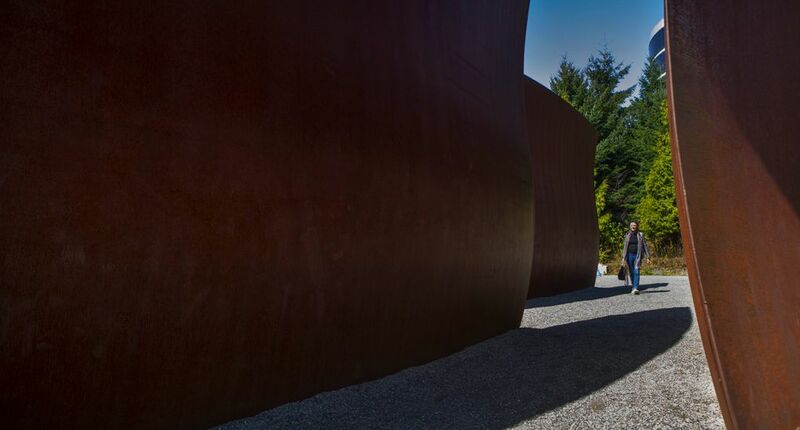 She walks to the Olympic Sculpture Park no matter the weather. The park is social, with people, kids and dogs, and it provides soothing green space. We admired blooming dogwood and looked at the snowline on the Olympic Mountains across Puget Sound. At Western Avenue, she pointed out the danger to pedestrians of a higher speed limit. The city should make it two-way, add sidewalks and trees, and slow it down, she says. She noted how the streets grew busier as we neared downtown. At Pike Place Market, we looked at housing for retired seamen, built in the 1980s, that now serves as subsidized housing. She reflected on how she once came to the Market regularly for cheese and cold cuts, fruits and vegetables. She still visits, just not as much as before. We returned along Second Avenue. As we walked past Bell Street, where the city limited traffic and added plants and other design elements, she commented on how retail stores were leaving the neighborhood. She sees people order vitamins online instead of walking a block to the convenience store. “I would much rather take the excuse to walk around,” she says. When Bénédicte Bicaba walks Ravenna Park, descending through a grassy, open field to the quiet, wooded trail, time slows. The sound of traffic fades, replaced by trickling water, the tweets of birds and the crunch of feet on gravel. Sometimes, people are camped underneath the 15th Avenue Northeast bridge. The path leads from Roosevelt to a favored brewery in Ravenna — or to University Village to finish errands. Walking reminds Bicaba of her childhood in the country of Burkina Faso in West Africa. Not everyone had a car, bike or motorcycle, so they walked. As a kid, she walked to school with friends, or to get a soda. Walking connects her to home. She moved to Nebraska, where cars dominated, when she was 12. She missed walking. For Bicaba, walking is not an intentional workout. We met after work, and she did our hourlong walk in work flats, with her dog Bam-Bam. In Ravenna, she pointed out places where there were no sidewalk curb ramps. We talked about the growth of Roosevelt, with a light-rail station under construction. She likes to take new streets whenever she can, and explore. “I enjoy long urban walks,” she says. Walking also shifts her experience with time. On a walk, she and her boyfriend will discuss a wider range of topics than when they’re not walking. Walking to a restaurant or bar with a friend means they get walking time and the meal to catch up. Walk with her, and there is no sense of rush; she is tuned in. “Walking brings you into the moment,” she says. Liz Davis, 49, grew up walking the streets of the Central District. As a graduate student, she walked to do homework at a coffee shop at Martin Luther King Jr. Way and East Cherry Street, now home to a Thai restaurant; she knew all the businesses at that intersection. Back in the 1970s, the Central District was a place people lived and walked to work, she says. As an adult, walking saved her life. Through movement and lifestyle changes, 16 years ago she lost 180 pounds. 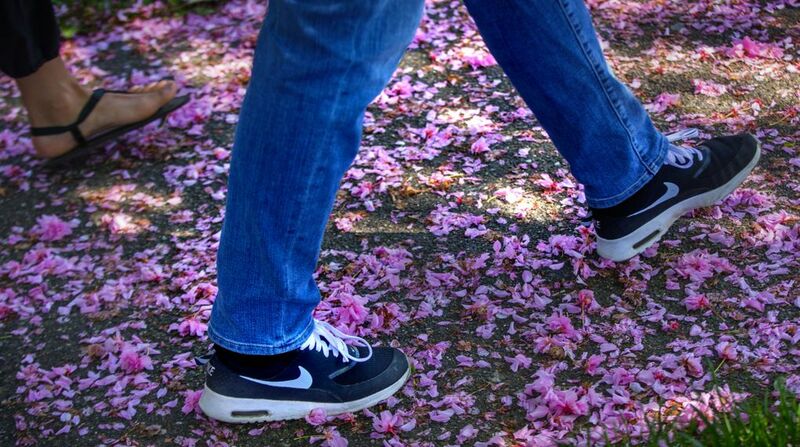 Now, she walks for her health, and to see cherry blossoms. Davis also leads neighborhood walks to keep the community strong and healthy, and she shares information on historic sites that connects her walkers with local business owners. Walking can be both a fitness and a community benefit, she says. 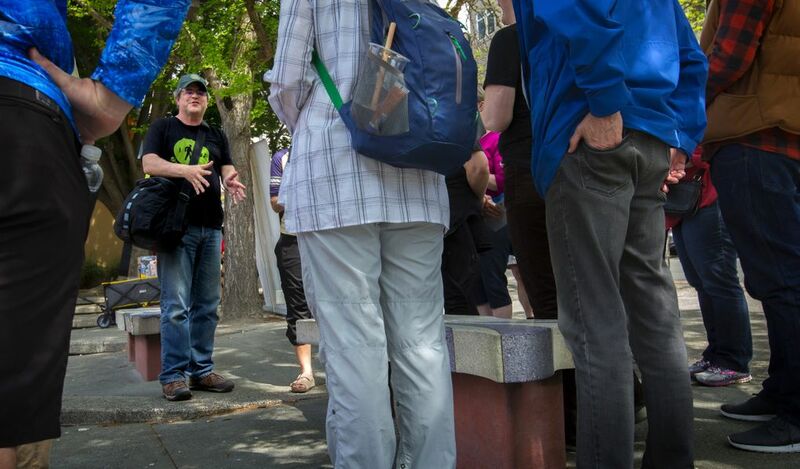 The Central District is an inherently walkable neighborhood, says John Stewart, a resident since 1997 and an ambassador for Feet First, a pedestrian advocacy group. He benefits from living within walking distance to the grocery store, the coffee shop, his kids’ school. When he moved here in 1997, the neighborhood was struggling. Recently, with the rising housing market and location near downtown, the neighborhood has had an influx of new development and residents, along with the departure of local businesses and longtime residents from the historically African-American neighborhood. For Stewart, 48, who has walked since he was a teenager, walking is the intersection of health, of community and of his neighborhood. A walk to get ice cream with his kids, or to the convenience store, keeps him tied to the history and layers of the Central District, even as landmarks disappear and new development and residents unaware of the history move in. “It’s about community, not just housing,” Stewart says. Annette Jones sometimes feels nervous about walking. She was punched in the face in the street one day, unprovoked. Ever since, walking can feel stressful. 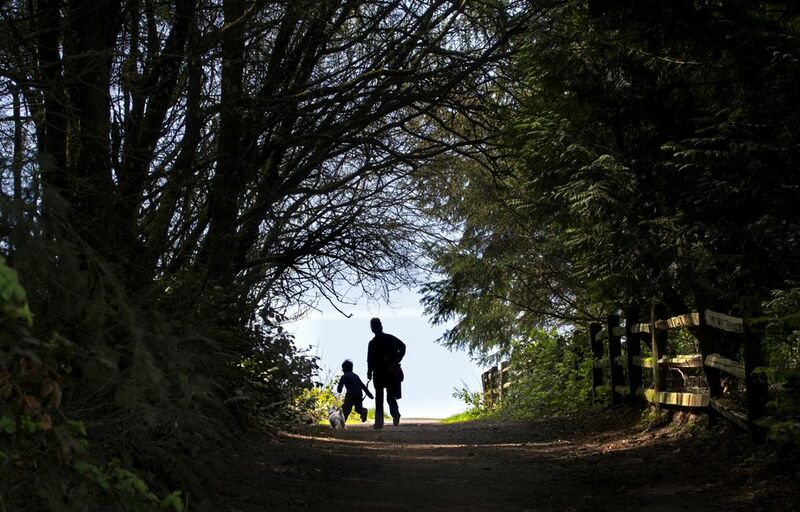 But she is determined to walk, so to help herself when she commutes from Tukwila to Columbia City, she takes pictures of nature. It’s tulip season, she points out on a walk through lush greenery and blooming trees in the residential Columbia City neighborhood between the light rail and her thrift shop. “I stay focused on beauty around me,” she says. Walking is also her road to recovery. Not long ago, she was in so much hip pain from arthritis and calcium deposits that when she tried to get up from a chair, she fell back. It scared her. 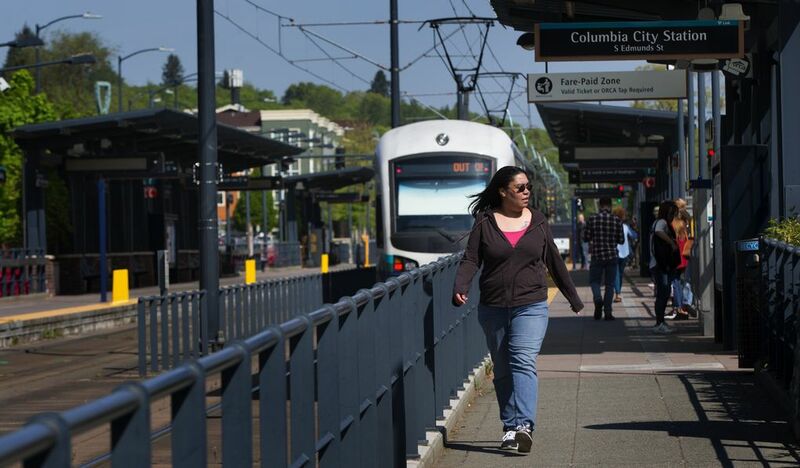 Her walk starts with a 10-minute trip to the Tukwila light-rail station. Walking from the Columbia City light-rail station to her thrift store is another 5 to 10 minutes through the leafy neighborhood skirting the business district. She often walks the half-mile from her shop to church at the Hillman City Collaboratory, following the uphill slant of busy Rainier Avenue. She marvels at the size of Seattle and how she sees people every day she will never see again. When she walks, she sees the same people, and it helps the city feel smaller. Community is vital to her. Formerly homeless, she knows how easy it is to lose touch. The more you fall out of community, the harder it is to reconnect. Nicole Tsong teaches yoga at studios around Seattle. Learn more or reach her at nicoletsong.com. Ellen M. Banner is a Seattle Times staff photographer.